The Cave of the Mind by Jim Jacobson and Red Varnum is the third Eamon adventure and the first written by an author other than series-creator Donald Brown. This adventure is the first by author Jim Jacobson who published four other early Eamon titles, and the only one attributed to Red Varnum. You're preparing for your next adventure when you meet a short man outside the Main Hall who beckons you over and shows you a grail filled with a bubbling green potion. Telling you that you're a special adventurer fit for a great challenge, he hands you the grail with a wink, then disappears. You quaff the potion and find yourself magically transported to a dimly-lit stone room from which you must start your explorations. Contrary to the introduction's promise of extreme challenge, The Cave of the Mind is a straightforward outing with no particularly difficult elements to overcome, though there is one death-trap and a couple of interesting effects to watch out for. Exit the dimly-lit room and travel along the narrow tunnel to the east, dispatching the vampire bat you find there. Beyond is a T-intersection where a north-bound tunnel intersects the east-west one. Stay on the east tunnel to reach a small chamber made of quartz; defeat the enormous snake that lives there and take the valuable black pearl. Return to the T-intersection and head north. You should now be at a four-way intersection. The archway to the east is the path forward, while the exits west and north lead to side chambers. The west chamber is actually the bottom of a deep open pit (though there's no way to climb out) and is inhabited by a wizard sitting by a television set; befriend the wizard and take the TV. In the north chamber is a lush garden where you encounter an enormous Venus Flytrap and find a diamond. Going east from the 4-way intersection puts you in a large empty dining hall. To the east is the kitchen where you find a chef with a meat cleaver whom you may be able to befriend. North from the dining hall is a corridor that leads first past a pair of guest rooms to the east and west. In the west room you can befriend or defeat the fencing master you find there and take a silver crucifix. The east room is empty except for a valuable painting, and has a closet to the south. The closet is empty, but carved on the wall is an inscription. Reading the inscription ("Peace begets peace. Put down your weapons and leave violence behind you.") causes all of your weapons to disappear. They're not gone for good, just scattered in other rooms of the adventure and you'll need to retrieve them. Return to the corridor and continue north. You'll pass a side-tunnel to the east, which is the path forward, but for now explore to the north. Further on is a door to the east marked "do not enter"; obey this order, because by entering you will fall down an open elevator shaft and be killed. North, the tunnel terminates and you can get a miner's pick. Go back south and take the east tunnel you passed before, which leads to a chamber where a troll guards a rolled piece of parchment. Defeat the troll and take the scroll, which reads: "This entitles the owner to one free cyber-bit should the owner make it out of here alive." Continuing north from the chamber along the narrow tunnel you find a lead box; if you choose to open it, it will cast the power spell (with unpredictable and possibly deadly results), while a voice says, "Beware my magical spell... <Trilder!>"
Go north again into a very large room inhabited by a cyclops. Defeat him and take his magic club, and pick up the grail of green potion – drinking it is your means of exiting the adventure. Before you leave, explore the side-chambers. To the east you'll find a woman, to the north an uncrossable chasm, and to the west a Cylon robot and a strange metal helmet (which despite it's appearance does nothing but is still valuable). Quaff the potion and you find yourself back outside the Main Hall. If you held onto the scroll, you will receive the following message: "You win a free cyber-bit: tell the attendant and he will pay you." The Eamon Deluxe version incorporates new challenges and additions made by Frank Black, who states in the Eamon Deluxe Newsletter that roughly 50% of the revised adventure's content is new. You can take the miner's pick back to the south room with the large snake, where using it on the wall will reveal a room containing a chest, a friendly character called A.J. (who will appear in subsequent adventures), and a harmonica which you will need later. The wizard will not be your friend in the Eamon Deluxe version owing to being utterly absorbed by his TV. Taking the TV will make him angry and he will fight you for interrupting his favorite soap. You will find some additional enemies in the room with the metal box, though they shouldn't cause trouble. After opening the box and being teleported elsewhere, you can also return to this room and find a ruby inside. After passing through that room, you will find yourself bedeviled at various points by a mysterious booming voice. Entering the open elevator shaft won't kill you; rather it will lead you to an out-of-order elevator car with a panel on the wall with a keyhole and a button. Pushing the button without the key has the chance to plunge you down the shaft so it's not recommended. When you have defeated the cyclops, the game isn't over and you won't see the grail. Head east to meet the Cylon, but don't kill it. You will notice that the silvery helmet is described as a thought control helmet, so wear it and type "use helmet on Cylon" to make it an ally. Head into the west room to meet the woman called Jane; it turns out she is another vampire, so use the crucifix on her if she's giving trouble. Return to where you fought the cyclops and head north to the chasm, then examine the suspicious quartz stone in the wall to find a musical note. Use the harmonica to magically bridge the chasm and head north. Head north into the lab where you confront The Mind itself, a brain in a cybernetic skeletal body. However much damage you and your companions do, you cannot directly harm the mind; attacking the lab equipment is the key to defeating it. Take the treasure and the key, then backtrack to the north/south passage where you found the miner's pick and head east into the elevator. Unlock the panel with the key, then push the button and you will ascend to a small attic room where you see the little man who gave you the grail. The man turns out to be a robot with a chest full of grails and money (it seems The Mind has been luring adventurers here to rob them); take the cash and the grail and drink to finish up. If you have A.J. and the chef with you, you will be told where they went following the adventure. You will also get a free autobot symbol in exchange for your cyberbit as well. Reviewer Tom Zuchowski describes Cave of the Mind as "strictly for beginners and Hack'n'Slash fans", rating it a 3 out of 10, with a difficulty of 4 for beginners and much less for experienced players. The Eamon Adventurer's Guild rates it at 3.2, the average of seven ratings. Reviewer Luke Hewitt however, reviewing the Eamon Deluxe version was far more taken with the adventure, awarding it an over all rating of 7 though still agreeing with the difficulty of 4. He praised the lighthearted and quirky atmosphere, plus the many colourful descriptions and affects, and enjoyed the surprises which both Jim Jacobson and Frank Black added to the adventure, including the addition of the title character "the Mind" itself as an overall antagonist. The Cyclops reappears when he is kidnapped by Nazis in Camp Eamon. In the adventure's Eamon Deluxe adaptation, several characters go on to further Jim Jacobson Adventures if they escape the cave as friends. The chef, for example, reappears in both The Zyphur Riverventure and The Abductor's Quarters, as does the Eamon Deluxe-only character A.J. Cylons are the robotic enemies in the 1978 television series Battlestar Galactica. 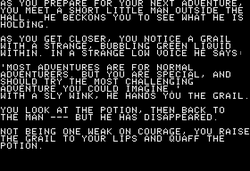 The title file on the adventure diskette gives the adventure's name as The Mind of the Cave.